Manchester United were crowned champions of England for the 18th time on 16 May following their 0-0 draw with Arsenal. United, Liverpool, Chelsea and Arsenal have all qualified for the Champions League. The top three will go straight to the group stage, while Arsenal will face a play-off. English clubs are offered three places in the Europa League (formerly the Uefa Cup) - for the FA Cup winners, the Carling Cup winners and the fifth-placed team in the Premier League. As FA Cup winners Chelsea and Carling Cup winners Manchester United have already qualified for the Champions League, the fifth, sixth and seventh-placed teams - Everton, Aston Villa and Fulham - have qualified for the Europa League. The Intertoto Cup - previously an alternative route into the Uefa Cup for clubs - has been abolished. West Bromwich Albion were relegated to the Championship on 17 May, and they were joined by Middlesbrough and Newcastle United who both lost on the final day of the season. Wolverhampton Wanderers are champions after their 1-1 draw with Barnsley on 25 April. Birmingham took the second automatic place after winning 2-1 at promotion rivals Reading on the final day of the season, and Burnley beat Sheffield United 1-0 in the play-off final. Charlton Athletic, Southampton and Norwich City are relegated to League One. 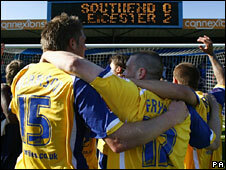 Leicester City confirmed their rise to the Championship and the League One title with a 2-0 win at Southend on 18 April. Peterborough United secured the second promotion place by beating Colchester 1-0 a week later, and Scunthorpe United beat Millwall in the play-off final. Hereford United, Cheltenham Town, Crewe Alexandra and Northampton Town are relegated to League Two. 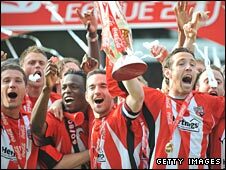 Brentford are promoted as champions after beating Darlington on 25 April. Wycombe and Exeter joined them on a dramatic final day of the season, while Gillingham beat Shrewsbury in the play-off final to claim the final place. Luton Town and Chester City are relegated to the Blue Square Premier. Burton Albion have been promoted to the Football League as champions. Torquay United join them after beating Cambridge United in the play-off final on 17 May. Lewes, Northwich, Woking and Weymouth are relegated. Four teams are promoted to the Blue Square Premier - the champions and play-off winners of the Blue Square North and South divisions. 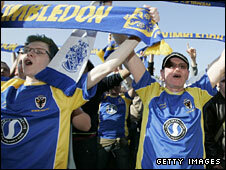 AFC Wimbledon were promoted after clinching the Blue Square South title with a 3-0 victory over St Albans City on 25 April, with Hayes & Yeading joining them after a 3-2 victory over Hampton & Richmond in the play-off final. Tamworth secured the Blue Square North title after beat Hinckley United 1-0 on 21 April and Gateshead will join them after a 1-0 win over AFC Telford United in the play-off final. Rangers were crowned SPL champions after winning 3-0 at Dundee United on the final day of the season and will go straight into the Champions League group stages. Runners-up Celtic also make the Champions League but will face two qualifying rounds. Hearts and Aberdeen, who finished third and fourth, will qualify for the Europa League, as will Scottish Cup beaten finalists Falkirk, as winners Rangers had already qualified for the Champions League. There are also three additional places awarded to the three national associations that finish highest in its Respect Fair Play league standings. Norway, Denmark and Scotland were the highest-ranked associations - earning each an extra place. Motherwell were put forward by the Scottish FA as the highest-placed club in its own fair play standings which had not already qualified for Europe. Bottom club Inverness Caledonian Thistle were relegated to Division One after losing to fellow strugglers Falkirk in their final game. St Johnstone made sure of the title and promotion to the Scottish Premier League by beating Morton on 2 May. Clyde were relegated on the same day as they finished bottom despite defeating Dundee, while ninth-placed Airdrie United were relegated after losing in the play-off final to Second Division side Ayr United. Raith Rovers were crowned champions on 2 May and will be promoted to Division One, while Ayr United beat Brechin City and First Division side Airdrie United in the play-offs to earn promotion. Bottom club Stranraer were consigned to an immediate return to the Third Division on 4 April when they lost 3-0 to Raith Rovers. Queen's Park were also relegated to Division Three after losing on aggregate to Stenhousemuir in their play-off semi-final. Champions Dumbarton will be promoted to Division Two having finished four points clear at the top top of the table. Stenhousemuir overcame Queen's Park and Cowdenbeath in the play-offs to earn the second promotion place. There is no relegation from this division, with Elgin City finishing as Scottish senior football's bottom club this season.